Today, urban informality has become key to balancing the ecosystem of a globalized world. 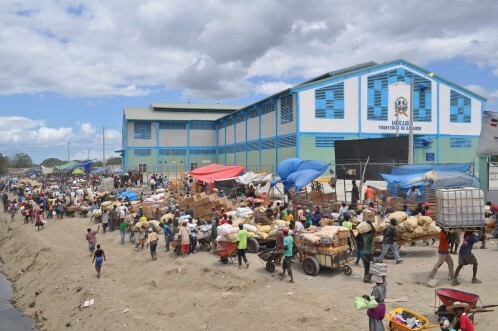 While part of everyday life for billions of people, official political engagement with informality is often contradictory, obscuring and repressive – from the World Bank’s warning of a “drag on growth” to informal trade being denounced as criminal and notorious by monopolist organizations. 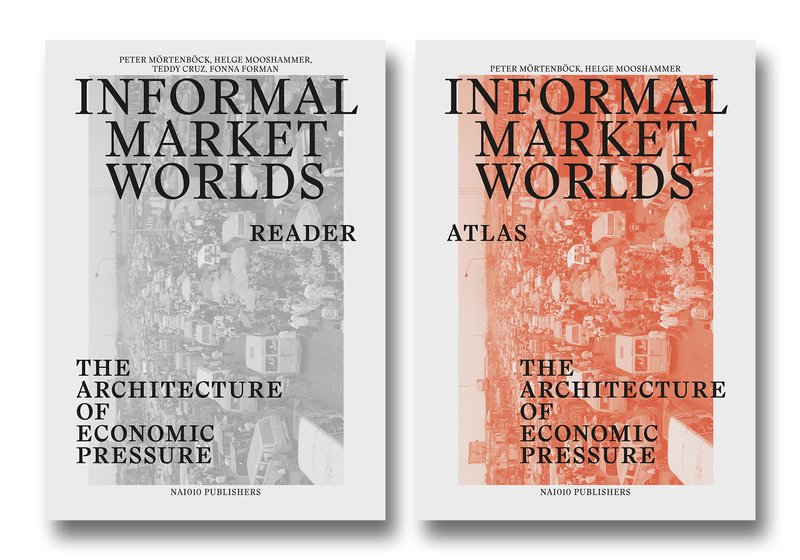 The contributions to the two-volume publication Informal Market Worlds aim to challenge the hegemonic stance about informality as subordinate: In the Atlas, 72 accounts of informal market places worldwide map out the breadth of current economic transformation, from the absorptive function of post-conflict and border markets to the liberal aura of metropolitan hipster markets. Assembling seminal voices in the field of global and urban studies, from Keith Hart to Ananya Roy to Saskia Sassen and AbdouMaliq Simone amongst others, the Reader connects crucial analyses of the conceptual and historical trajectories of informality with a multiplicity of perspectives on the urgencies posed by today’s informal realities. “Interrogation Series: Informal Public Demands” reflects on what Teddy Cruz and Fonna Forman—together with Peter Mörtenböck and Helge Mooshammer, editors of Informal Market Worlds—have termed “informal public demands”, i.e. the changes in urban policies and planning practices required to engage with informality in a productive and fair manner. A series of questions to the editors and contributors will relate these demands to the ongoing physical transformation of New York and its embeddedness in global processes of informalisation, be in the realm of finance, urban development or social relations. This event is organized on the occasion of the launch of Informal Market Worlds – The Architecture of Economic Pressure. Atlas & Reader, ed. Teddy Cruz, Fonna Forman, Peter Mörtenböck and Helge Mooshammer. These books track the powers, currents and actors driving informal trade. They document the growing influence informal economies are having on human co-existence on a planetary scale. Informal markets may have turned into key urban economic frontiers, but can they also produce positive social and political change? Bringing into focus the contested spaces at the bottom of the world economy, the Informal Market Worlds Atlas presents 72 case studies of informal marketplaces around the world—from Kabul’s post-conflict Bush Bazaar to Casablanca’s counterfeit markets, from street vending in Bangkok’s “red zones” to cross-border trade between Haiti and the Dominican Republic, and from the 7th Kilometre container market in Odessa to New York’s booming hipster markets. Exploring the conflicted realities of informal market worlds, the Informal Market Worlds Reader brings together texts on urban informality, global struggle and design activism by eminent scholars and practitioners, including Teddy Cruz, Alejandro Echeverri, Keith Hart, Ananya Roy, Saskia Sassen, Richard Sennett, AbdouMaliq Simone, Gayatri Chakravorty Spivak, Jean-Philippe Vassal and many others. Peter Mörtenböck is Professor of Visual Culture at the Vienna University of Technology and visiting researcher at Goldsmiths College, University of London, where he has initiated the Networked Cultures project (www.networkedcultures.org), a platform for global research on collaborative art and architecture practices. His current work explores the interaction of such practices with resource politics, global economies and urban transformation. Helge Mooshammer is director of the international research projects Relational Architecture and Other Markets (www.othermarkets.org) at the School of Architecture and Planning, Vienna University of Technology. He is currently a Research Fellow in the Department of Visual Cultures at Goldsmiths College, University of London. His research is concerned with changing forms of urban sociality arising from processes of transnationalization, capital movements, informal economies, and newly emerging regimes of governance. Teddy Cruz is a Professor of Public Culture and Urbanization in the Department of Visual Arts at the University of California, San Diego. He is known internationally for his urban research on the Tijuana/San Diego border, advancing border neighborhoods as sites of cultural production from which to rethink urban policy, affordable housing, and civic infrastructure. Recipient of the Rome Prize in Architecture in 1991, his honors include representing the US in the 2008 Venice Architecture Biennale, the Ford Foundation Visionaries Award in 2011, and the 2013 Architecture Award from the US Academy of Arts and Letters. Fonna Forman is a Professor of Political Theory at the University of California, San Diego and founding Director of the UCSD Center on Global Justice. She is best known for her revisionist work on Adam Smith, recuperating the ethical, social, spatial and public dimensions of his political economy. Current work focuses on climate justice in cities, on human rights at the urban scale, and civic participation as a strategy of equitable urbanization. She presently consults on climate justice for the California Carbon Neutrality Initiative, and serves on the Global Citizenship Commission, for her expertise on social and economic rights. Robert Neuwirth has spent most of the past four years hanging out with street hawkers, smugglers, and sub-rosa import/export firms to write Stealth of Nations, a book that chronicles the global growth of System D — the parallel economic arena that today accounts for half the jobs on the planet. Prior to that, he lived in squatter communities across four continents to write Shadow Cities, a book that attempts to humanize these vibrant, energetic, and horribly misunderstood communities. His articles on cities, politics, and economic issues have appeared in many publications, including Harper’s, Scientific American, Forbes, Fortune, The Nation, The New York Times, The Washington Post, Metropolis, and City Limits. Before becoming a reporter, Neuwirth worked as a community organizer and studied philosophy. He lives in New York City and does most of his writing on manual typewriters. Vyjayanthi Rao is the Director of Terreform Center for Advanced Urban Research in New York. Prior to her appointment at Terreform, she held research and teaching positions at The New School, at Yale University and at the University of Chicago. From 2003 to 2005, she served as a co-director of PUKAR (Partners for Urban Knowledge, Action and Research), an innovative urban think-tank based in Mumbai. Her work focuses on the intersections of urban planning, violence and speculation in the articulation of the contemporary global city. Her publications include Speculation, Now: Essays and Artworks (2014), edited with Carin Kuoni and Prem Krishnamurthi, and the forthcoming monograph Speculative City: Infrastructure and Complexity in Global Mumbai. Hakan Topal is an artist and scholar living and working in New York City. He is an Assistant Professor of New Media and Art+Design at the State University of New York’s Purchase College and a member of the graduate faculty in the School of Visual Arts’ Fine Arts Department. He was a cofounder of xurban_collective (2000–12) and has exhibited extensively, including at the 8th and 9th Istanbul Biennials; apexart, New York; Thyssen-Bornemisza Art Contemporary, Vienna; Kunst-Werke, Berlin; ZKM Center for Art and Media, Karlsruhe; MoMA PS1; Platform, Istanbul; and the 9th Gwangju Biennial.